It’s hard to explain why I am now wandering round, quite publicly, in a County-Jena t-shirt – a shirt that commemorates two teams I don’t support and a match I never attended – but it feels good. At the start of the 80s – in the midst of my Taylor-inspired yellow world – Gavin arrived in my South Bucks school. With a thick Welsh drawl and an amber and black scarf, he stood out dramatically amongst us spotty adolescents. 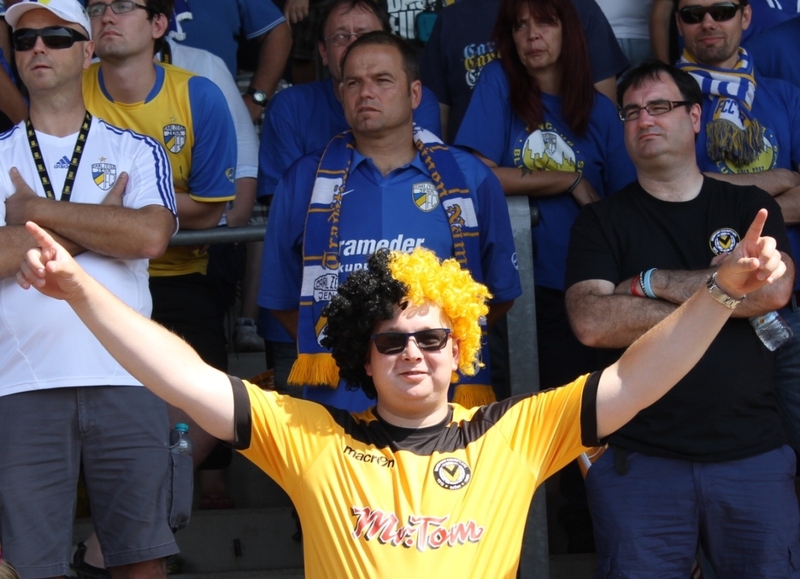 Obsessed with football, this was the catalyst for Newport County entering my consciousness. Though back then, all three of the four major Wales clubs had their day in the sun, with the new decade; it was Newport and Swansea that were stealing the show. Swansea, under Toshack, went from bottom to top and back again, however the most romantic story was being played out 50 miles east. Having justly qualified for the last eight in the 1981 European Cup Winners Cup – with John Aldridge injured – on the 4th March, County travelled to East Germany to face a team containing most of its national side. For the Welshmen getting this far was a real achievement; when Tommy Tynan levelled in the 90th minute the national media started really paying attention to this Welsh fairytale. Six years to the day later, Jimmy Gilligan came to the end of his loan period with County. Though some of the shine had rubbed off the club since their European success, this wasn’t seen as a bad move for Gilligan; Newport were still the highest placed Welsh team in the entire league, and they also afforded him, he explained “a much better chance of first team football”. 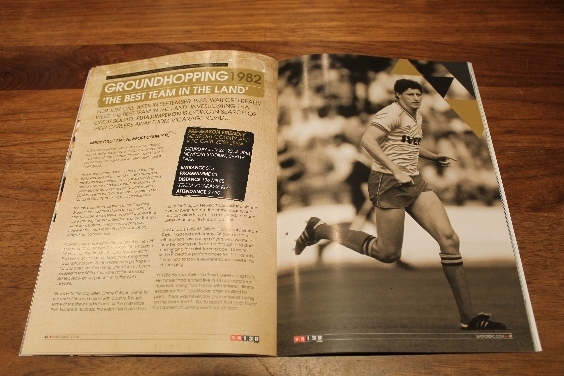 In Watford’s 1982-83 Official Handbook; Graham Taylor had said that Jimmy Gilligan and the other juniors “are young players who we must now be looking at, to come through and start challenging for a first team place.” Despite some incredible performances for the Hornets, Jimmy had to look elsewhere to succeed in his “challenging”. In 1986 his side, Swindon Town, were riding high. He himself had scored five in 13 appearances however; being “top heavy with strikers” Jimmy explained that “Lou Macari often shuffled his pack. There was never any guarantee of being on the team sheet.” So, to reach that goal Taylor had spoken of, Jimmy went out on loan. Commuting daily – as his son Ryan had just been born – Jimmy worked hard to impress. Whilst he was completely familiar with their recent fame, Jimmy insisted first team football was his sole motive. A month later – having helped County stem their slide, in five good appearances – Jimmy was sadly on his way back to Wiltshire. Then County manager John Lewis desperately wanted Jimmy’s signature however serious financial irregularities, at the time of Jerry Sherman’s involvement on County’s board, made this ultimately impossible. Newport would eventually be relegated that season but, who knows what would have happened had Gilligan stayed. Club historian Andrew Taylor was adamant “the fans would’ve loved him to sign but the money was not there.” Jimmy himself told me he’d have been happy to stay on at the South Wales club. Of his team mates he explained “There were no high flyers; just an honest, very working class group, with a special togetherness.” Having not felt so at Swindon; Jimmy loved the ritual Friday afternoons at the local cafe, for curry and chips, and unparalleled banter. 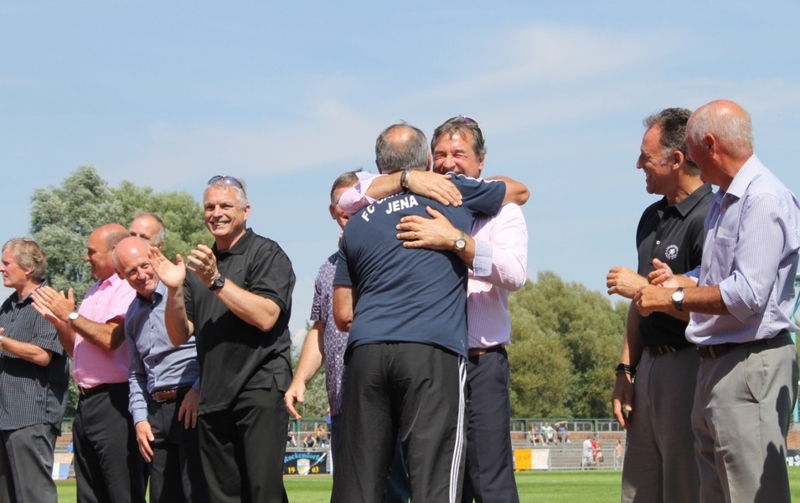 In particular, he singled out the late Mark Kendall (goalkeeper) as both “a great bloke” and “one of the funniest people I’ve ever met.” Having been to the Jena rematch, it was a sense of camaraderie I could easily identify with. Though in 1981 away goals may have seen Newport through to the Cup Winners Cup Semi-Final, eventually going out 0-1 in the home leg only tells half the story. The game was so one-sided; tales of being one of the 18,000 crammed into Somerton Park will be retold down endless generations. Having seen the highlights again – just to double check my ailing memory – County keeper Gary Plumley wasn’t wrong when recounting, “I think of it as the result that never was – we annihilated them.” And with that wonderful folklore was created. In the subsequent years both Jena and County fell on hard times. Now residing in their respective fourth tiers, for the clubs and fans alike, this encounter still means everything. In the ground this unity was demonstrated wonderfully with side-by-side merchandise stalls, filled bar areas, and fans totally mixed everywhere one looked. 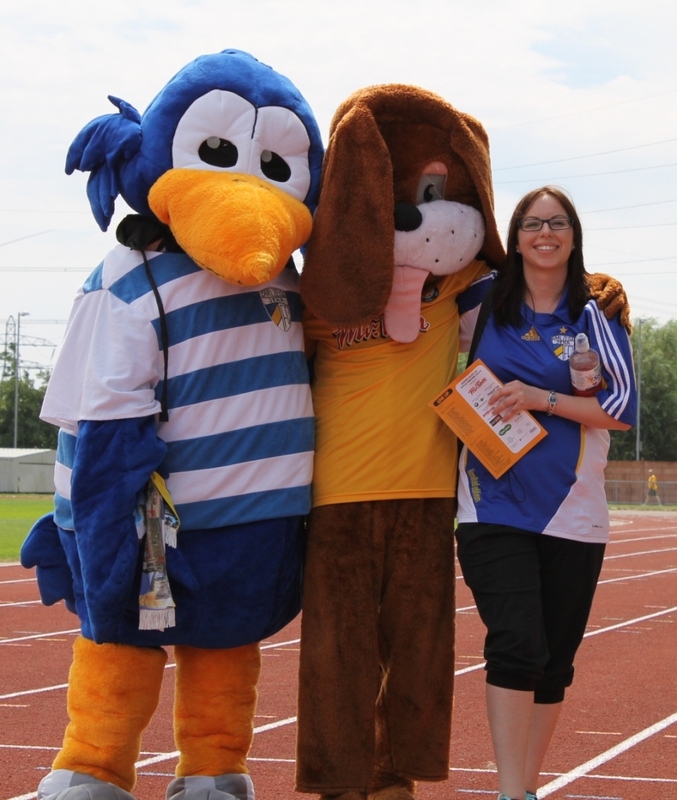 Before kick-off, as he teams warmed-up, visiting fans were permitted photo calls on the running track and speeches were given on behalf of both the respective towns. Raising the goodwill even further, at half time, players from the original tie were lauded by all sections of the crowd. In wonderful weather, the match was played out in equally good spirits. Both County and Jena attacked in delightfully gun-ho fashion and when they wilted everyone stopped for water breaks and conversation. Even the second half streaker – eventually covered by Lenny Pidgeley’s towel – wasn’t removed from the ground. Behind their banners, songs rang out from supporters as their new heroes wowed respective fans with commitment and effort. Compared to the day itself, looking back, it’s probably fair to say the result was irrelevant. 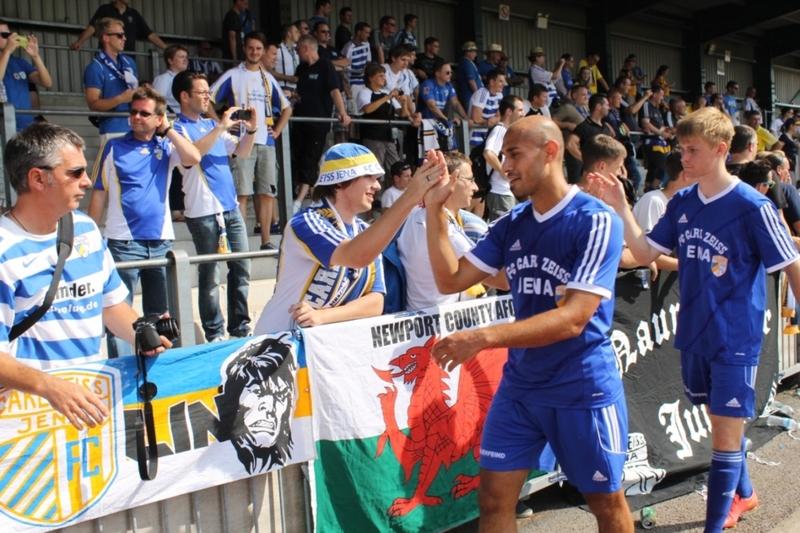 Though this time just a Darren Jones goal separated the sides, both had great chances and afterwards fans and players alike, congratulated each other on the continued special relationship these club share. Demonstrating that football can be played in a fantastic environment, this was an almost perfect season opener. 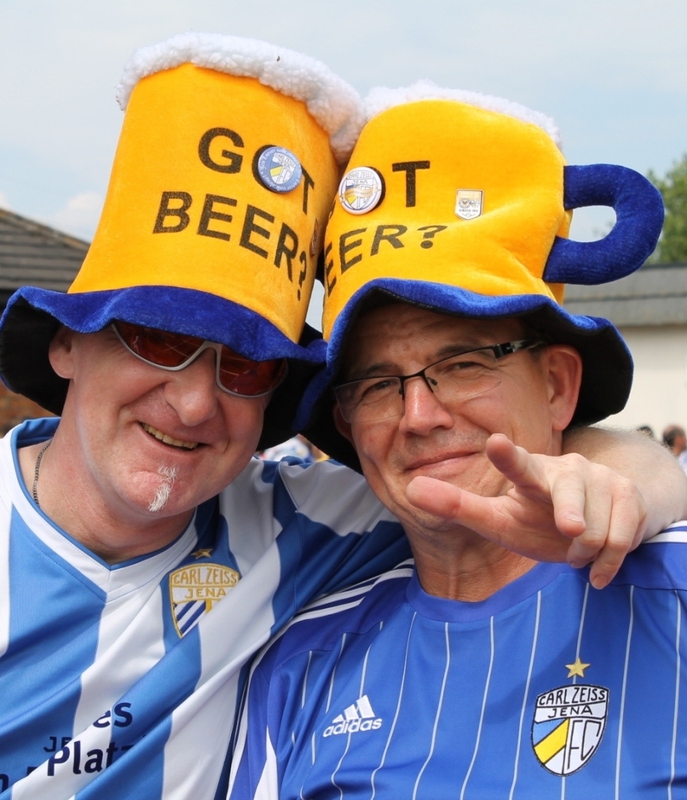 Both Newport County and Carl Zeiss Jena should be rightly proud of their endeavours. 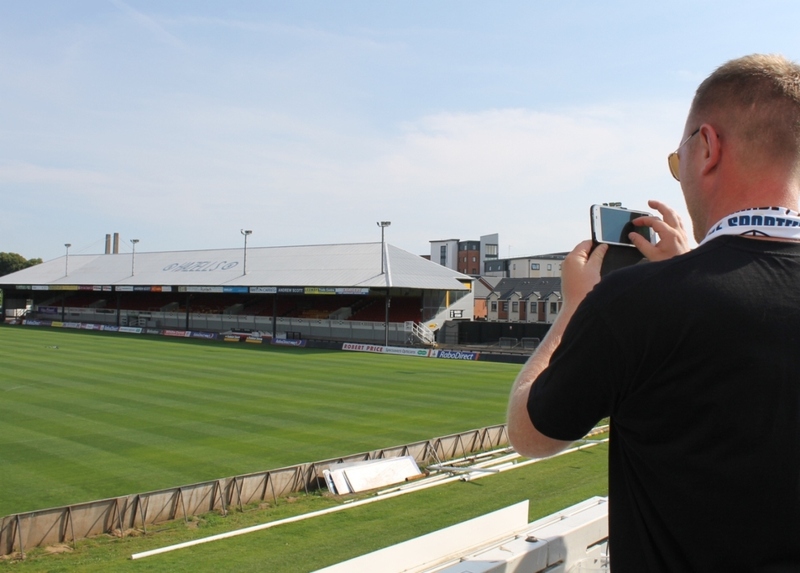 Moving en masse afterwards, to Rodney Parade, Jena fans – on a pilgrimage – had photographs taken in Newport’s new home, as joint celebrations continued late into the night at a family fun day. Having soaked up more emotive football than most fans see in a season, just before leaving, the last thing I noticed was Chief Executive, Dave Boddy, rightly surveying the festivities with obvious pride. 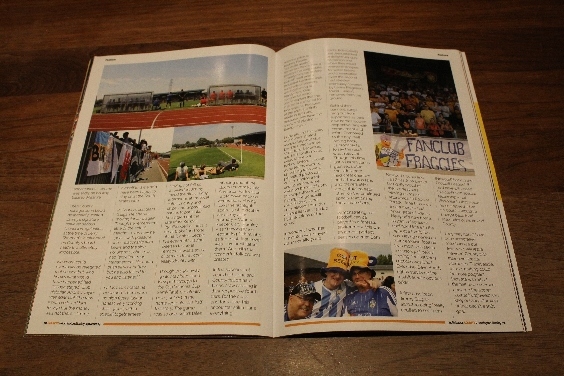 A few days back, Jimmy Gilligan admitted being “really chuffed to see them [Newport] back in the Football League”. If he’d have witnessed this continued special fellowship – not dissimilar to that which he so enjoyed – I’ve no doubt it would’ve bought back fond memories of his time at County. 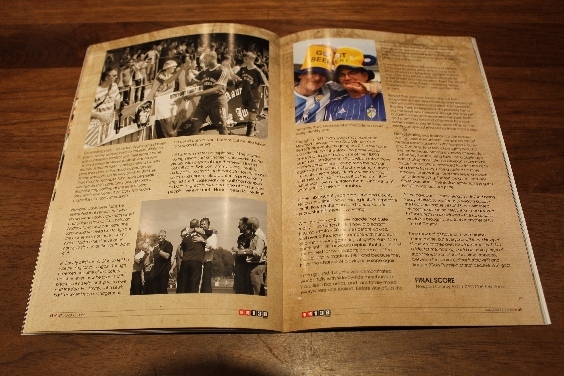 They may not all have commemorative merchandise but everyone, will leave Newport County with their own special memories. T-shirt aside, for me, nothing could be more poignant than the warmth of the half time embrace, between the scorer (Lothar Kurbjuweit) and keeper (Gary Plumley) of that decisive 1981 goal. 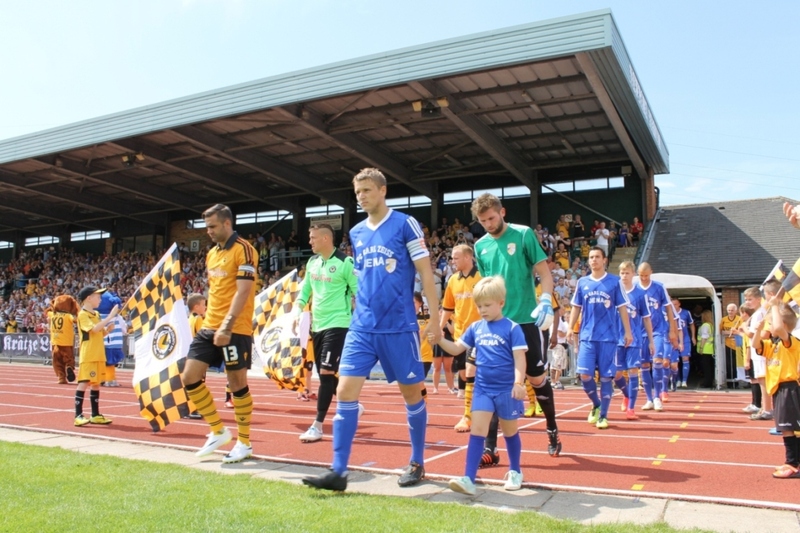 This entry was posted in #WFC1982, 2014-2015, pre-season friendly and tagged #WFC1982, European Cup Winners Cup, FC Carl Zeiss Jena, Jimmy Gilligan, Newport County AFC, Newport Stadium, pre-season friendly, Spytty Park, Watford FC. Bookmark the permalink.